A Master in Fine Arts graduate from the World Music program at the California Institute of the Arts, Robin Sukhadia studies tabla (classical north Indian drums) under the virtuoso tabla maestro Pandit Swapan Chaudhuri at CalArts and the Ali Akbar College of Music in San Rafael, California. 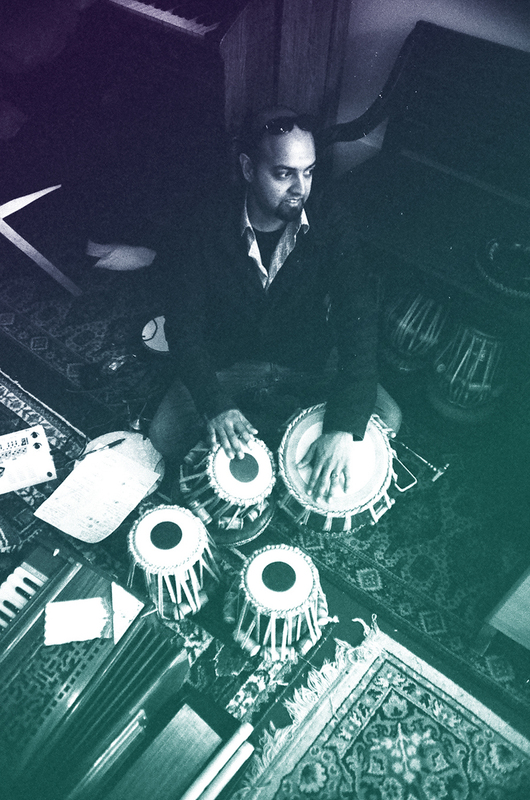 His special focus on the musical traditions and rhythms of south Asia informs his approach to musical arrangement and composition on a wide range of concert, film, and album productions. He has composed music for and toured internationally with acclaimed world music act Rupa & the April Fishes (Cumbancha Records), live hip hop ensemble J-Boogie's Dubtronic Science (OM Records), Indo-jazz group PremaSoul, and famed instrument inventor and MacArthur Fellow Walter Kitundu. He helped score the 2008 Emmy award winning PBS documentary Sikhs in America and his music appears in My Narmada Travels, Dreaming in Code, and Raspberry Magic, films written and directed by Leena Pendharker. In 2018, he performed in Walt Disney Concert Hall in Los Angeles as a tabla soloist on Reena Esmail’s oratorio “This Love Between Us”. For over twelve years, Robin traveled internationally on behalf of Project Ahimsa, an organization committed to empowering impoverished youth through music education. He served as the organization's International Grants Program Director, working closely with NGOs worldwide to develop and sustain music education programs for the underserved. Under his leadership, over twenty music programs received musical instrument donations and financial support to provide music teachers with salaries in countries including India, Nepal, Cuba, Nicaragua, Mexico, Sri Lanka and the United States. In 2008, he helped produce and develop the music for Global Lingo, an album featuring the talents of children impacted by Project Ahimsa and remixed by world famous DJs and producers. The album reached #2 on the iTunes World Music charts for 3 consecutive weeks and was reviewed positively on NPR. All proceeds from the album were used to expand Project Ahimsa's existing music education programs around the world. He performs extensively, in both classical and contemporary contexts, and has developed innovative music education programs at the Mahatma Gandhi Ashram in Ahmedabad, the Weill Institute at Carnegie Hall, Eagle Rock School in Estes Park, Colorado, the Los Angeles County Museum of Art, the GRAMMY MUSEUM in Los Angeles, the Hammer Museum in Los Angeles, the de Young Museum in San Francisco, the Asian Art Museum in San Francisco, the Machine Project in Los Angeles, the Sangati Center in San Francisco and Shree Mangal Dvip Boarding School in Kathmandu, Nepal. In 2010, he curated and executed the capstone classical concert for Lucknow: India's Fabled City, an international exhibition produced by the Los Angeles County Museum of Art. He was an Artist in Residence at the Machine Project in Los Angeles in 2008 and at the Hammer Museum in Los Angeles in 2010. He completed a Blue Mountain Artist Residency in the Adirondacks, NY in 2013. In 2010, Robin was awarded a Fulbright Senior Research Award as well as an American Institute of Indian Studies Fellowship to expand his work with music education for underserved communities in India. His research in India was focused on bolstering 6 music education programs across India and Nepal, each serving children in some of the poorest regions and communities of south Asia. A major outcome of his research period was the successful production and international tour of EKATVA, which featured 16 street children from the slums of Ahmedabad. EKATVA, which means Oneness in Hindi, presented Mahatma Gandhi's message of non-violence and tolerance in a dance drama format. Robin implemented logistics and helped raise funds to enable all 16 children a support staff to tour 15 cities throughout the USA and the UK over the summer of 2012. The tour generated significant international fundraising support, enabling all 16 children to attend private schools in India free of cost. The children continue to study intensely still, with the plan that all will pursue higher education. He presently works in Los Angeles as a Senior Advancement Officer at the Colburn School, considered among the world’s foremost music education institutions.